Day 6: Apse or No Apse? Yesterday was a very productive day for most of us, but not for things relating to the excavation. The wind was up to 40mph for much of the day and driving rain made it particularly unappealing. As one of our team put it, ‘If you jump, you’ll land in Treshnish!’ Some team members briefly checked on the site to make sure our equipment was secured, but in general we called off the excavation due to high winds. Instead, we all stayed in the house and wrote various reports, theses, and dissertations. The wind died down by about 6pm, so a group of us took an evening stroll to the Abbey to try to catch it in a different light. Even more exciting, though, was the spotting of our resident corncrake! Corncrakes are both very rare and very elusive, so this was particularly special. We have heard a corncrake in the garden both this year and last, but had only briefly spotted it once when it dashed from one end of the garden to the other. Last night, we not only spotted our corncrake, but watched it for about ten minutes while trying to capture it on video! The quality isn’t great due to the sun having set, but you can see and hear our garden corncrake well enough. Today was somewhat cold, but brilliantly sunny. We began by excavating many of the modern layers we began digging on Thursday. We excavated a large layer full of shell, which was used to make mortar in the rebuilding of the abbey in 1904. As for the stone structure, we began excavating the area just beyond last year’s trench boundary, and we found the stones continue! The curious news is that the stones seem to continue in a straight line, and least for the next half-metre. This either means that our structure doesn’t have an apse in the eastern end, or that the structure (and its apse) is a lot wider than we thought it was. We’re hoping it’s the latter. Whatever it is, we’ll keep you posted! If you happen to be in the area, we are excavating for the next several weeks. Feel free to stop by and say hello! Many thanks for the updates! Much appreciated. Loved the corncrake. We saw a couple on North Mull last year (Treshnish cottages), but they are quite rare to see now. 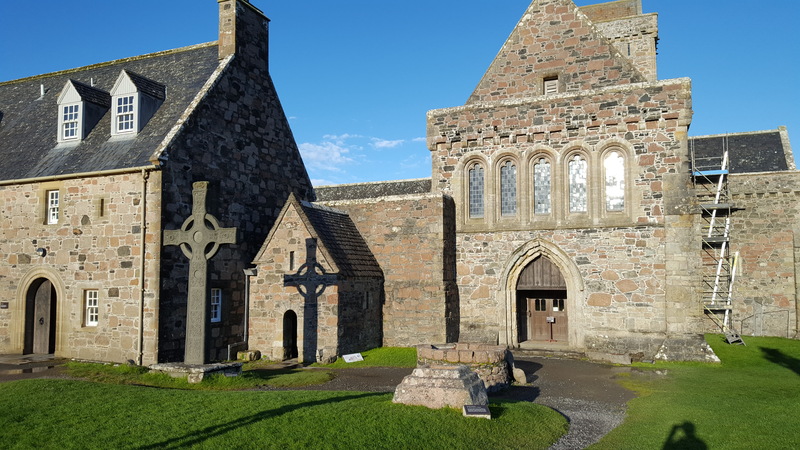 When I was maintenance man at the Iona Community, back in the very early 1980s, I remember Attie McKechnie (1950s member of the community and Master Builder, who later worked on Abbey manintenance, died 2005) telling me that there were earlier structural walls beneath the Nave fairly close to the Transept and sort-of partially in line with the door to the cloister. There were some metal gratings in the floor than could be removed and you could see some structures underneath with difficulty. I think there were also some flagstones that were liftable nearby there. There was no reason for any of them them to be lifted when I was there, so I was unable to investigate further. However I think that they may well line up with your extended wall. I gathered that they were discovered during the rebuilding in the very early 1900s. I don’t know if there were any records made back then. The only plan I have seen only has an earlier wall shown running the length of the Nave, but I am fairly sure that these went cross-ways. If you have not already done investigated this, then it maybe worth following up (or at least keeping in mind). Do you have a date for this possible apse? Hi Andrea, the possible apse is 8th century or earlier.